Co-operative - Website of torbaystrokesurvivors! Here's a photo of the presentation we held for the Torbay Stroke Survivors Computer Group at our Funeral Home. 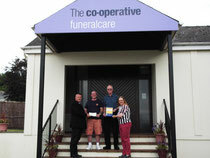 In the photo from left to right; Marc Blaynee (Principal Funeral Director from Torquay), Shaun McNally (Group Treasurer), Brian Gunn (Computer Group Member) and Kay Mc Cullough (Co-operative Area Committee Member). The photo was taken at Moorview Funeral Home, Co-operative Funeral care. 79-85 Barton Road, Torquay, TQ2 7NY.